His Highness Sheikh Mohammed bin Rashid Al Maktoum, Vice-President and Prime Minister of the UAE and Ruler of Dubai, gave the green light on Monday to start the world's largest investment in Concentrated Solar Power (CSP) project that will provide clean energy to 270,000 homes. Based on Independent Power Producer (IPP) model, the 700MW fourth phase of Mohammed Bin Rashid Solar Park will officially commence to complete the overall park scheduled to be the largest single-site solar energy project in the world, with a planned total production capacity of 1,000MW by 2020 and 5,000MW by 2030. Taking to Twitter after the launch, Sheikh Mohammed said: "Dubai has the lowest Solar energy production cost in the world. Our target is to have 75 per cent of the total power output from clean energy by 2050." He added: "We approach our plans in speed. There's no sustainability for a development that doesn't provide a clean environment to future generations." The fourth phase, co-developed by the Dubai Water and Electricity Authority (Dewa) and Saudi Arabia's Acwa Power, will be implemented in stages within the next four years to help reduce about 1.4 million tonnes of carbon emissions annually. Saeed Mohammed Al Tayer, managing director and CEO of Dewa, said work will start on the project immediately, to finish it by in stages by 2020. The Dh14-billion phase will also have the largest thermal storage capacity. 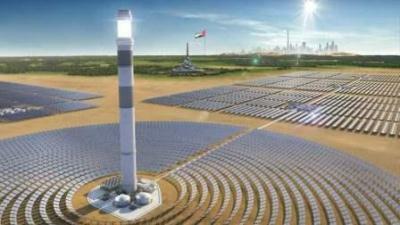 It will include the world's tallest solar tower, measuring 260 metres. Al Tayer said within the next five years, Dubai plans to spend Dh81 billion on clean energy projects, with 50 per cent contribution from private sector and the rest from Dewa. "This will help us strike a balance between economic growth and sustainability while conserving our natural resources," said Al Tayer. "Renewable energy projects are expected to continue globally due to sunny climate, which makes the UAE a reliable source for sustainable clean energy for everyone." He added that renewable energy projects made up 62 per cent of globally energy projects in 2016, more than twice as much compared to 2006. He said the solar park is part of Dubai's efforts to redirect the economy into a fuel independent one. Of the solar park, 1,000MW will be operated by CSP Model, among which the 700MW was launched on Sunday. The 700MW project will use two technologies to produce clean energy: A 600MW parabolic basin complex and a 100MW solar tower, taking over an area of 43 square kilometres. Mohammed Bin Rashid Solar Park will reduce over 6.5 million tonnes of carbon dioxide emissions annually and power 800,000 homes by 2030. The solar park is a total investment of Dh50 billion. The project serves as part of its Clean Energy Strategy, under which Dubai is looking to have 7 per cent of its total power output from clean energy sources by 2020, followed by 25 per cent by 2030 and 75 per cent by 2050. Last March, Sheikh Mohammed launched the second phase, which generates 200MW of clean energy, to power 50,000 houses and reduce 214,000 tonnes of carbon emissions. The park's 13MW first phase was launched on October 2013. The project generates over 28 million KwH of electricity annually and has decreased carbon emissions by 15,000 tonnes annually. The third phase, led by Abu Dhabi's Masdar to develop 800MW, will be implemented in stages until 2020. It achieved a world record low tariff of $2.99 cents per kilowatt under a competitive bidding process. Mohammed Bin Rashid solar Park will provide Expo 2020 Dubai with a dedicated capacity of 464MW of clean energy. "This will be the first Expo in the world to be completely powered by clean energy," Al Tayer said. "Today, the world is in a constant search for sources of energy, water and raw materials. The UAE has taken advanced steps in preserving the environment and natural resources, through solar power projects to diversify energy resources and increase the share of renewable energy while reducing carbon emissions," he said. >The world's largest investment in a Concentrated Solar Power (CSP) project based on the Independent Power Producer (IPP) Model. >Covers a total area of 43 square kilometres.